Thursday 7 November 2013 marks the centenary of the death of Alfred Russel Wallace, one of the 19th century’s greatest explorers and naturalists. This display celebrates Wallace’s long association with the Museum and its collections. Alfred Russel Wallace (1823–1913) was a scientific and social thinker, early biogeographer and ecologist. Although now less famous than his contemporary and correspondent Charles Darwin, the self-taught Wallace arrived independently at a theory of the evolution of species by natural selection. In 1858, Wallace published On the Tendency of Varieties to Depart Indefinitely from the Original Type, prompting Darwin to publish On the Origin of Species the following year. Darwin had been working on his theory for twenty years, and here was an outline of that same idea, written by a relative unknown. 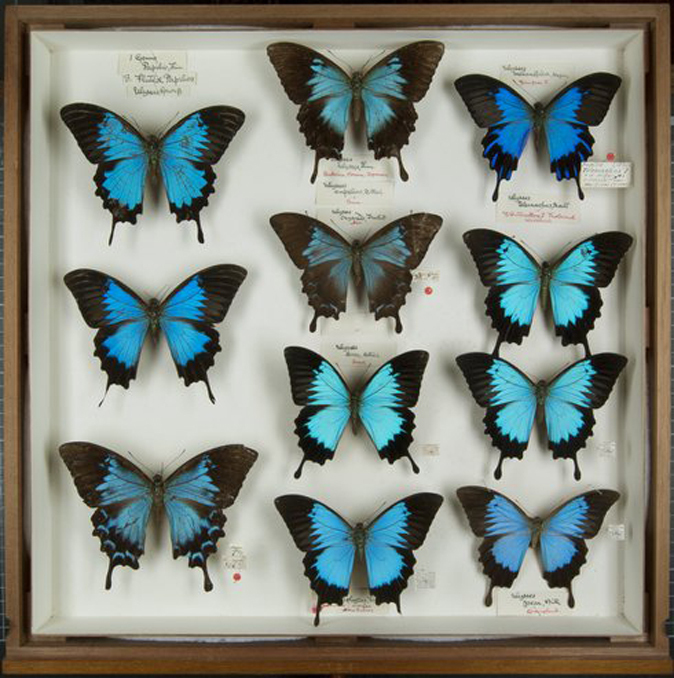 These are from the Museum’s extensive butterfly collection. Specimens marked with a red dot were collected by Wallace during his travels to Amboyna (1859) and Batchian (1858–59). This Museum holds tens of thousands of specimens collected by Wallace, mainly from the Malay Archipelago, including many type specimens which were new to science. The collection also includes nearly 300 of Wallace’s letters. Oxford University’s Pitt Rivers Museum, the Museum of the History of Science and the Herbarium also all hold Wallace material. It is a testament to the talents of Wallace as a collector that such fragile specimens arrived back in Britain in perfect condition. Wallace visited Oxford occasionally and was awarded a degree in 1889 by the University. He initially refused to accept this, regarding himself as ‘an amateur’ in natural history and remaining keenly aware of his lack of formal education, despite the importance of his theories.